“Every two years, the American Paint Horse Association World Championship Show is infused with a multi-cultural vibe. Mixed with the announcer’s patter and traditional horse show sounds, the air is filled with Aussie twangs, German accents and lovely French harmonies. Swedes, Dutch and Canadians mingle with the crowds, giving the event a real international flavor. 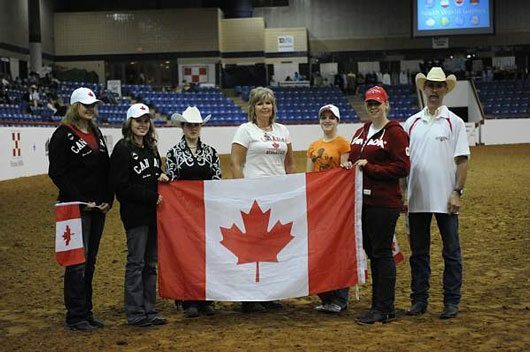 The Canadian Youth Paint Horse Team: from left Brooke Barber, Rinske Rupert, Emillee Chamberland, coach Melisa Barber, Kirsten Chamberland, Breane Bailey and assistant coach Todd Bailey. The Canadian Team was ready to go. It is hard at this time of the year to leave Canada as all of our competitors were writing year end exams. Breanne Bailey, our trail rider was late coming down a few days due to the fact that she still had to write her grade 12 diplomas. The teams consist of four competitors and an alternate as well as their coach. We were down at Fort Worth, Texas for ten days. The organizers for the APHA did a fantastic job of keeping us busy, informed and supplying the teams with some very good horses. 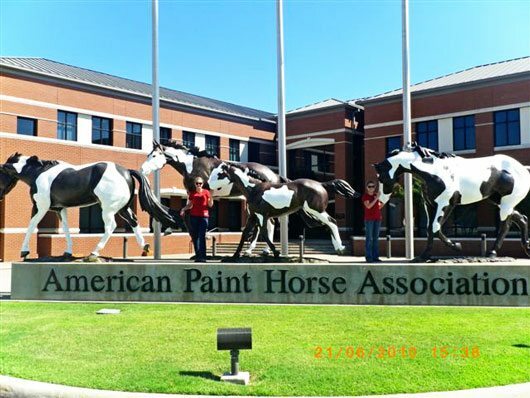 Brooke and Rinske visitiing the APHA office in Fort Worth, Texas. The first full day took us to North Central Texas University and with their horses the kids were given “mini” clinics in the events of which they were showing in. The next day was fun games for the kids, handing out the pattern books, as well as choosing the horses. This was done in a pull the name out of a hat theme. The teams were to be using horses that were suited for the specific event of which they were to be showing in. The following day found all the team members going to find their horse. You are not allowed to ride, walk, groom your horse prior to your event, you can however find saddles to fit you if need be. 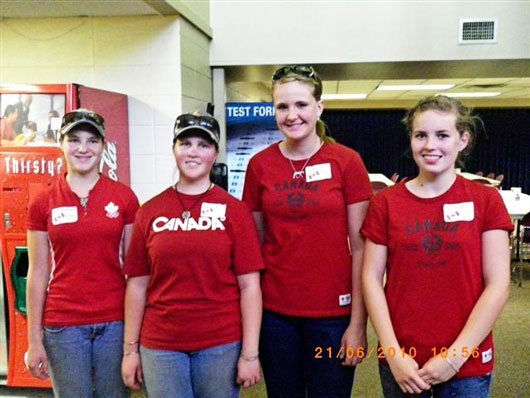 The team, short of Breane Bailey, who arrived a few days later when her Grade 12 Finals were completed! First up Showmanship, Rinske Rupert from Three Hills Alberta was up. The owners or trainers bring your horse to a meeting area, when all the horses for the eight team members are there you have 15-20 minutes to get to know your horse. Time to show. This can be very nerve racking and stressful for the competitors. All of our girls did an excellent job in handling themselves they were true professional and represented there country in the best possible manner. Rinske won a 5th place for her efforts and brought home a Top 5 Youth World Halter and lead shank. The horse she had chosen was only 4 year old and wanted to play with the shank a little bit. Brooke Barber from Carbon, Alberta was up for Hunt seat Equitation. She chose a lovely 17 hand high 4 year old. It was a tight pattern for such a large horse but the duo thought things thru and pulled off a fourth place. Emilee Chamberland hailing from Langley, British Columbia did a great job on her little mare for Western Horsemanship placing fourth. Breanne Bailey from Red Deer, Alberta rode for us in Trail. It was a tough course but I think she got through with only two ticks giving Team Canada there third placing. Our alternate was Kirsten Chamberland from Langley British Columbia and she rode for Team United. The APHA felt that since the alternates were coming from such a long way to potentially not ride they put them together to from another team, Team United. Before the last event all that separated the top 4 teams was a couple of points. Receiving the Gold was Team Holland, Silver – Team USA, Bronze – Germany and Canada was fourth. I am so very proud of all of the girls. It was their first time showing at the World Show.